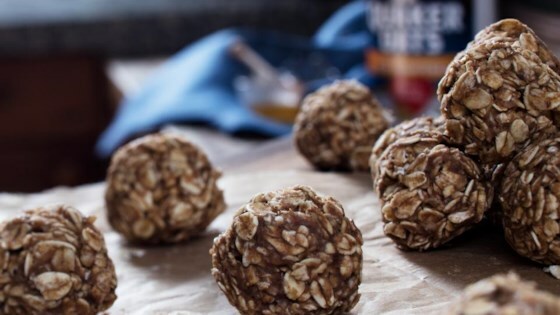 "Peanut butter, banana, cinnamon, and lots of oats make quick bite-size energy snacks." Place oats and cinnamon in large bowl; stir to blend well. Add mashed banana, peanut butter and honey. Stir until ingredients are well blended. Shape into 24 (about 1-inch diameter) balls. Refrigerate, covered, until chilled. Store leftovers in refrigerator, covered. These are easy and taste fantastic! I added 1/2 cup of mini chocolate chips. They actually taste like cookie dough!